A charming and traditional chalet-style hotel, Les Ancolies is located right in the centre of Arêches-Beaufort, and is just 200m from the slopes. 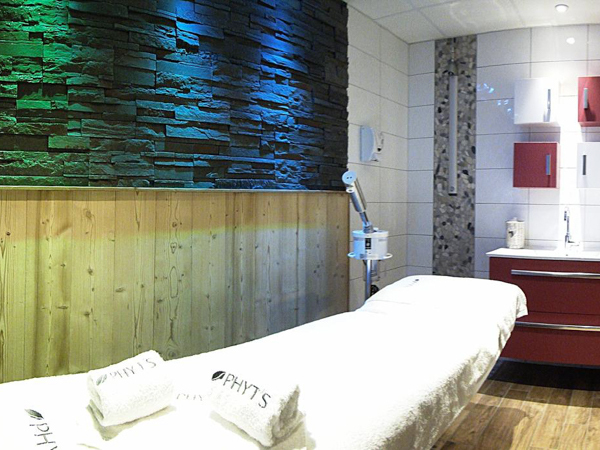 Ski hire is also close by, and there is a good choice of services and facilities from your door. 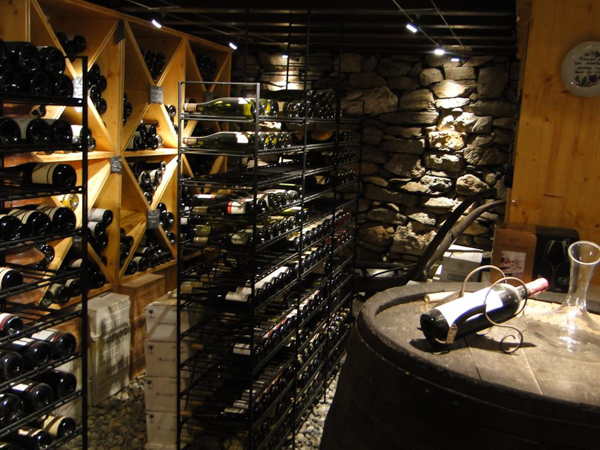 All of this enables you to get the most time on the slopes during your short break, as well as plenty of opportunities to enjoy your après-ski and explore the authentic mountain village. The hotel offers traditional hospitality and service. 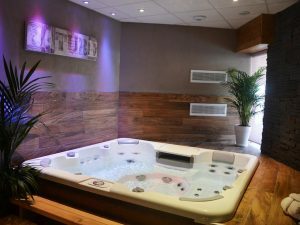 There is a lounge and bar, complete with a pool table and games where you can unwind after a busy day on the slopes, meet up with other mountain enthusiasts and compare your day’s adventures. 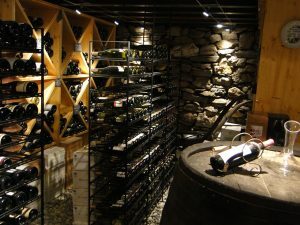 In the evening you can enjoy relaxing over a glass of wine, and sampling some very good local specialities in the dining room. The hotel offers comfortable, Alpine-style ensuite bedrooms with TVs and is a member of the Logis de France. Stays at Hotel Ancolies are available for groups of 6 guests or more. Please contact us for further information and to check availability. The hotel offers triple, double and family rooms (bunk bed in family room), though tends to have mostly doubles, which makes this an ideal hotel for couples. The rooms are spread across 2 floors and 2 adjacent chalet buildings accessed by an external stairway. 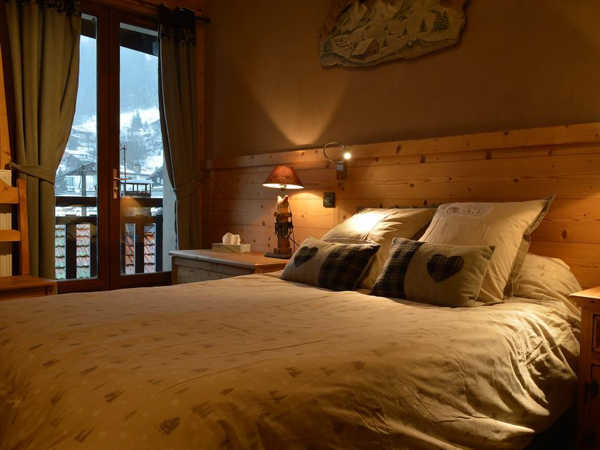 The ensuite rooms are decorated in a traditional mountain chalet style, with wooden furniture. They also have flat-screen TVs plus WiFi. The hotel has a very sunny south-facing terrace overlooking the mountains, as well as a comfy lounge area and bar containing a pool table and a variety of board games to while away the evening. If you want to pamper yourself a little, across the road you will find their wellness centre with a sauna and jacuzzi, as well as offering spa treatments which Ski Weekender guests may take advantage of at a discounted rate. 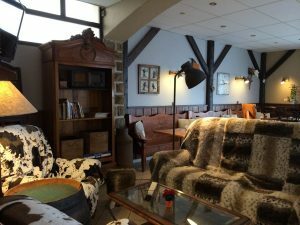 The hotel is also at the heart of the village so its easy to wander and visit the other bars, restaurants, shops and additional facilities in Arêches-Beaufort. The on-site restaurant has a very good reputation for its food, serving regional cuisine of a high standard. Catering is on a half board basis, including a continental buffet breakfast and a 3 course evening meal, which comes with a complementary glass of wine. The hotel is located in the centre of the village of Arêches-Beaufort, an area known well for its Beaufort cheese – a speciality of the Savoie region. It is a 2 hour transfer from Geneva Airport, but the views and skiing are worth it when you get there. 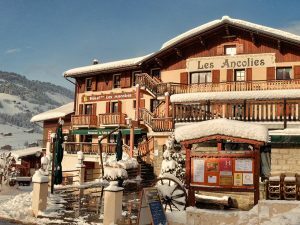 Only 200m from the slopes, as well as easy access to the ski-bus, Hotel Les Ancolies makes your ski experience an enjoyable one, giving you maximum piste time, as well as plenty to do when you get back down. Half board, including a glass of wine with evening meal. Full Arêches-Beaufort lift pass included in the price and ready for you on arrival. Afternoon / evening airport transfers included in the price. Airport transfers on Lite Packages are included for flights arriving at Geneva 1500 to 2100, and for departure flights taking off at 1600 or later. 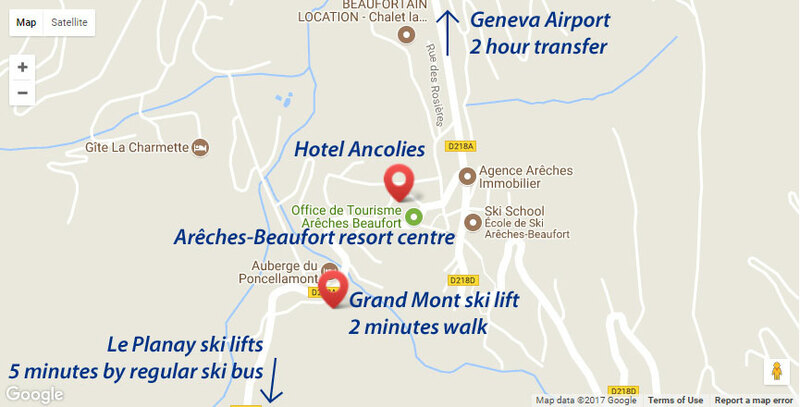 On departure, your airport transfer will leave resort 4 – 4.5 hours before your flight time, meaning an evening flight from about 2030 onwards will let you ski all day on your last day. 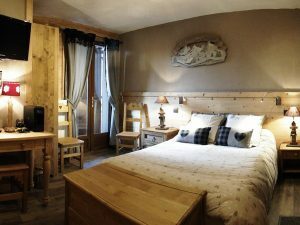 Stays at Hotel Les Ancolies are possible all through the winter season, from mid-December to mid-April, for groups of 6 guests or more. 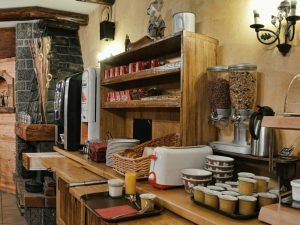 Stays are on a half board basis – including a continental breakfast buffet and 3-course evening meal with a glass of wine. 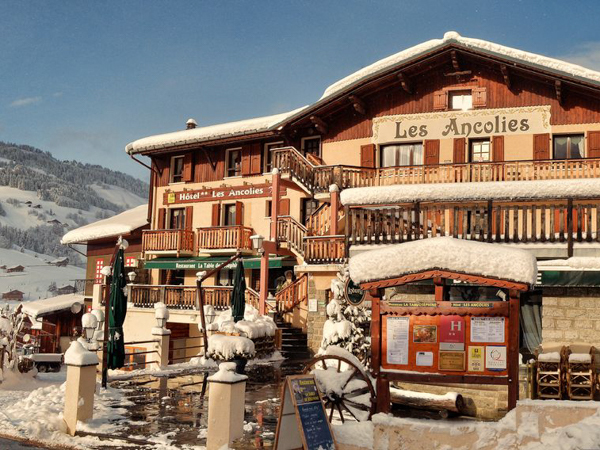 All stays at Hotel Les Ancolies include a full Arêches-Beaufort region lift pass, covering 50km of skiing. Airport transfers are included on standard break start / end dates, for flights scheduled to arrive into Geneva airport between 1500-2115, and depart 1600 or later. Transfer time from Geneva to Arêches-Beaufort is 2 hours. Ski and snowboards are available to hire at Gaspard Sports ski hire shop which is located just across the road from the hotel. We can recommend ski schools and mountain guides who provide good English-speaking ski instruction. 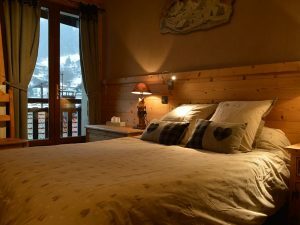 Ski Weekender guests staying in Arêches-Beaufort can pre-book their clothing package on our Ski Clothing Hire partner’s website. Word-of-mouth recommendations are important to us. Click on the TripAdvisor logo to see the many reviews from guests who’ve stayed at Hotel Les Ancolies. Want to stay at Hotel Les Ancolies... ?